The premium SUV market right now is packed with competition from various car makers. You have the Mercedes Benz GLC, the Audi Q5, the Volvo XC60 and the BMW X3. Each car does its own thing in a way better than the other, the X3 happens to shine in the driver engagement department. This definitely is the most driver-focused, most engaging SUV to drive in its class. We drove the 2-litre luxury variant for quite some time and here is our review on the car. With the new X3, BMW has introduced a larger kidney grille, which adds a lot more of aggression on the front end of the car. Talking about the front end, you now get all-LED headlights with a much more better-looking design. The nose protrudes out a bit more than before. The dimensions have been given some gains in all directions and the SUV now carries a much more proportionate design. On the side, you get 19-inch alloy wheels with 245 section rubber which provides ample grip. Another design highlight is a vent on the front fenders, also seen on other Beemers. Chrome accents on the lower edge of the door and around the greenhouse area add a premium touch. The rear gets a neat design too, which is quite understated when compared to the competition. 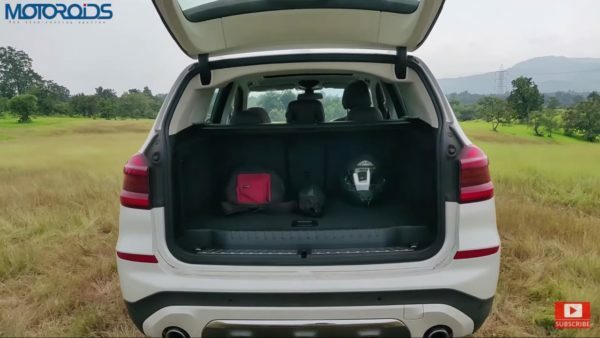 The rear also gets LED illumination and a faux diffuser with two tailpipes at both ends which add to the sporty appeal of the SUV. Coming on the inside, the BMW makes sure to remind you that the driver is the most important person in the car. The Centre console is tilted by a bit towards the driver. The fit and finish and the quality of materials are just what you would expect. We aren’t quite fond of the feel of certain hard plastics BMW has used in the lower sides of the car. The seats are covered in genuine leather and are quite comfortable, that said we have seen better seats in cars of this class. The rear seats again are not the most comfortable but offer great space. The large windows combined with the huge panoramic sunroof offer a great sense of space inside the cabin. Ample storage space is also present all over the cabin. The boot offers 550 litres of space and stores a space saver wheel underneath. The SUV comes packed with various tech features, you get a touch-enabled high definition widescreen for the centre console which is Android Auto and Apple CarPlay compliant. In the centre console, you get a wireless charging pad which not only can charge your phone but even the high-tech key that comes with the car. The key is quite similar to the one first seen in the 7-Series which provide various car information and can also pre-condition the car. However, it misses out on the smart park function, where the car can be remotely moved forward and back. You also get a Harmon Kardon music system which is rather nice. Apart from that you also get a bunch USB ports and all-digital instrument console. The tailgate is power operated. As mentioned above the X3 is the SUV in its class that you must drive to enjoy. The 2-litre 4-pot motor is mated to an 8-speed ZF sourced gearbox. It may not be the quickest gearbox that we have seen but it is not bad at all. 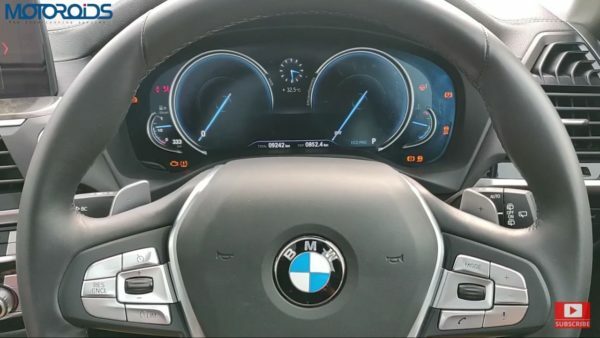 It works in good sync with the engine and can also be used manually via the shifters on the steering wheel. It offers the best blend of engagement and comfort. The engine on this car is tuned to make 190 hp and 400 Nm of torque. The 0 – 100 kmph run takes a little more than 8 seconds. The numbers do not matter much when you sit behind the wheel and command this SUV on the roads, did I mention this the best SUV to drive in its segment? 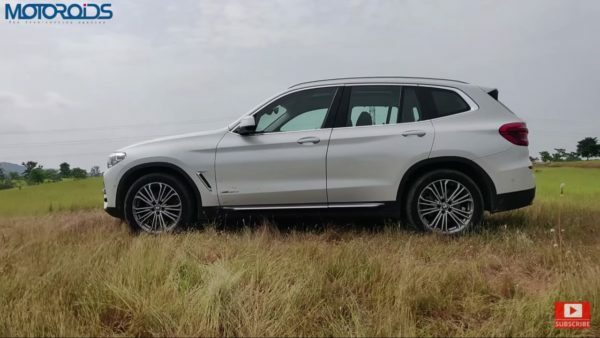 The X3 is offered in petrol and diesel engine options, the diesel comes in at INR 50 Lakhs for the base variant and INR 58 Lakhs for the luxury trim that we took a test of. So is the car worth the price tag? That is a difficult question to answer considering the Volvo XC60 that we recently reviewed offers so much more at a similar price point. 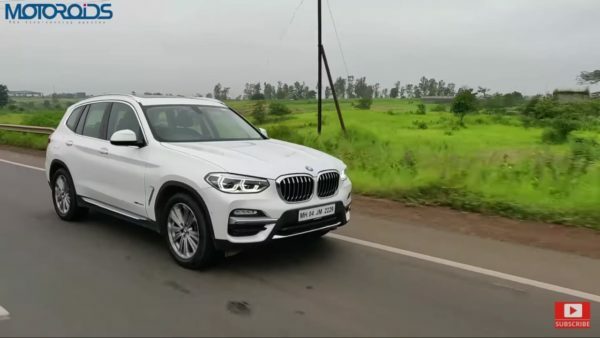 That said, the BMW X3 is a car that you need to buy from your heart, it offers you a blend of driving comfort and driving engagement like no other car maker has been able to provide and if you want to get behind the wheel of a premium segment SUV, the wheel better have the BMW logo on the centre. 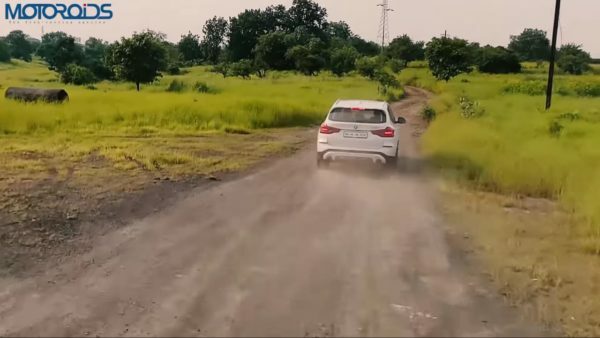 Do watch our video of the X3 linked below and stay tuned for more.